The Iona Abbey (Isle of Iona, West Coast of Scotland, ca. 563). The monastery of Lindisfarne (in the Holy Island of Lindisfarne, at the northeast coast of England), ca. end of 634. In Europe, only Ireland, Scotland, and parts of northern England were safe from barbarian invasions. During the first centuries of the Middle Ages this area of Celtic cultural tradition developed a monastic life in which a particular art style flourished reflecting, even more than the Byzantine art, a detachment from the shapes and forms of the real world. The Celts were people from the Iron Age and Medieval Europe who spoke Celtic languages and shared cultural similarities. During the Age of Metals, the Irish civilization evolved greatly. In the following centuries it didn’t experience the slightest Romanization, and thus managed to preserve intact the Celtic style originated in the time called “La Tène”, a European Iron Age culture named after the archaeological site of the same name that flourished during the late Iron Age (from 450 BCE to the Roman conquest in the 1st century BCE) in Austria, Belgium, the Czech Republic, Southern Germany, Hungary, eastern France, Poland, Romania, Slovakia, Slovenia and Switzerland. Ireland then continued organized in clans, in the form of small tribes with a monarchical hierarchy. The contact Ireland had with Christianity was very superficial, when in 432 a Briton monk, Saint Patrick, introduced in Ireland a primitive monasticism. Soon monastic life flourished on the island without abandoning its Celtic racial characteristics, and these first Irish monasteries developed a highly efficient and meritorious cultural influence. Their occupants learned Latin, also ventured to acquire knowledge of Greek language and culture, and commented the Holy Book with Celtic interpretation and spirit. Two of the most important artifacts found at the ship-burial of Sutton Hoo (6th to 7th centuries). Below: Shoulder-clasps. Above: Helmet. (British Museum). Soon, these early Irish monks were attracted by the idea of evangelizing the neighboring Scotland; Saint Columban went there in 565 and founded a monastery on the island of Iona in the southwest coast of Scotland. St. Columban’s preaching extended until the area occupied by Hadrian’s Wall, at the southern boundary of Northumbria a medieval kingdom that occupied what is now northern England and south-east Scotland. The foundation of the monastery of Lindisfarne in 653 by Aidan, a monk from Iona, coincided with the peak of this first monasticism independent of Rome in northern Great Britain. The Muiredach’s High Cross (10th or possibly 9th century) at the ruins of a monastery in Monasterboice, County Louth, Ireland. One of the Ahenny High Crosses, one of the oldest in Ireland (County Tipperary) which still bear resemblance to their wooden predecessors . Irish monks introduced to the Northumbria the preaching and instruction of Christianity, and in return received typically Nordic or Germanic artistic influences thanks to the contact with the invading Angles and Saxons who had settled on English soil contemporaneously with the arrival of St. Patrick to Ireland. These invaders had brought with them their Germanic decorative style, one of their brightest samples being certain objects with cloisonné and enamel decorations like those found in the royal tomb of Sutton Hoo, dating from the seventh century. The Abbey of Kells (Kells, County Meath, Ireland), early ninth century. The sculptural stone carving was first manifested in Ireland by interlacing Celtic ornamentation found in pillars and stelae; the most notable examples are the High Celtic stone crosses*, as those of Clonmacnoise Muiredach, Ahenny and Bealin which stand nearby the high cylindrical or conical towers of the old monasteries. These crosses, mostly dating from the eighth century, are imposing monuments which generally exceed three meters high and are fully covered by a sculpted decoration. Their arms are firmly rectangular, bordered by a molding reminiscent of the goldsmith crosses and are generally linked together by a large perforated circle that stands out against the sky. The foot of the cross is often divided into rectangles within which biblical themes are represented (Adam and Eve, Noah and the Ark, the sacrifice of Abraham, etc.). It seems that, scattered around the monasteries, these crosses played the role of guardians against the infernal powers coming from all points of the horizon that were thought to threaten the monks’ souls. Almost all of these monasteries of Irish tradition disappeared as a result of the incursions of the Vikings during the eighth and ninth centuries. In Great Britain, in Northumbria, the first monastery was destroyed in 793, it was the monastery of Lindisfarne mentioned above. In 801, the Vikings sacked Iona and the monks who managed to escape the island took refuge in the center of Ireland where they founded the monastery of Kells (just north of modern Dublin). The Anglo-Saxon Gosforth Cross (St. Mary’s churchyard, Gosforth, county of Cumbria, England) ca. first half of the 10th century. The Anglo-Saxon Bewcastle Cross (churchyard of St. Cuthbert’s church at Bewcastle, in Cumbria), ca. 7th or early 8th century. The Ruthwell Cross from the 8th century, the most famous and elaborate Anglo-Saxon monumental sculpture (Ruthwell church apse, Dumfriesshire, Scotland). The evangelization that took placed by the monks coming with Saint Augustine of Canterbury by order of Pope Gregory the Great also left in England several monuments showing a strong influence of an Anglo-Saxon style. This art is represented by high crosses with profuse decoration in relief, such as those of Hirton, in Northumbria, Gosforth or Kirk Braddan, on the Isle of Man. But the two most famous examples, both from the seventh century, are the Bewcastle and Ruthwell crosses, both in Northumbria. Both combine interlacing ornamentation and figurative carving, made in a style that suggests a strict influence of Italian Pre-Romanesque art. The Bewcastle cross has lost its top and appears as a pole carved in stone; its runic inscriptions said that it was ordered by Alfrith, son of Oswy, who was ruler of Mercia and died around the year 690. The Ruthwell cross has several overlapped gospel scenes and also includes a text in runic alphabet* which was used to write various Germanic languages before the adoption of the Latin alphabet. The Tara Brooch from about 700 AD (National Museum of Ireland, Dublin). The oldest objects we have from the Irish Celtic goldsmith show a clear survival of the artistic style of La Tène. The very form of brooches* or pins is characteristic of Celtic brooches of the same period: they consist of a circular ring forming the brooch with a needle that goes through it. Some of these Irish brooches seem very old; their ornaments are not a rectilinear interlaced, but spirals, and may be still from pagan times before the conversion of Ireland to Christianity. The oldest brooches are usually made of bronze with enamels and coral inlaid used by European prehistoric peoples. Later these brooches, instead of being a uniform ring, were broadened on one side, and on this flat surface artists gently drawn the most complicated decorative motifs. Brooches served to hold the mantles together, as seen in the reliefs of Celtic crosses and in manuscripts’ miniatures. Some of these brooches had exaggerated dimensions. The most beautiful of these brooches is that of Tara discovered in 1850. It is made of bronze, but its ring is covered with gold plates with interlaced decoration and enamels made with pieces of coral. The Ardagh Chalice from the 8th and 9th centuries, now in the National Museum of Ireland in Dublin. Below, details of the Ardagh Chalice: one of its medallions and a handle. The richness of this brooch or fibula has its rival in the famous chalice found in 1868 in Ardagh. The wonderful variety of its interlaced decoration is amazing, as well as the grace and elegance with which its bands and medallions are drawn, making it one of the most beautiful metal works of art of all times. The golden bronze annular band that surrounds the chalice is covered with the typical carved interlaced decoration made with incredible artistry. Its handles and two large round medallions are filled with abstract filigree and includes designs made with red and blue enamels. The Ardagh Chalice exceeds so much for its harmony and perfection all the known works of European jewelry of its time including the crowns of the Guarrazar treasure already mentioned in a previous essay. The reliquary for St. Patrick’s bell (National Museum of Ireland, Dublin). The third masterpiece of Irish metalwork is the gilded silver box that served as a reliquary for the historic bell of St. Patrick. The box has on its front face four interlocking panels combined with medallions; on its back has decoration with crosses surrounded by a legend that asks for several prayers, one for the king Domnell, which commissioned this reliquary, one for the bishop successor of Patrick at the Armagh miter, one for the guardian of the bell, and one for Cudilig and his son, who did the work. Of special interest is the box’s handle where among the interlaced decoration appear dragon heads in Scandinavian style. Another object of Celtic jewelry is the cross of Cong Abbey now in the Museum of Dublin. The jewel was itself a reliquary because contained a piece of the Holy Cross sent by the Pope around 1123. In its back, the arms of the cross are divided into interlocking panels and in the center there is a medallion where the relic was kept. Another masterpiece of Irish art is the crosier of the Abbots of Clonmacnoise which has a crest formed by a number of animals running after one another and a mitred figure of an abbot at the end of its handle. The Cross of Cong, early 12th-century. The cross was designed to be placed on top of a staff, but also works as a reliquary (National Museum of Ireland, Dublin). Cross of Cong: detail of its base. Metallic liturgical objects represented an important vehicle for the export of the Celtic art style on the continent, particularly in the Irish monastic colonies who settled in Western Europe. But an even more powerful means of diffusion of Celtic art and its interlaced decoration were illuminated manuscripts. The monks of Ireland, who had learned classical and Christian Science, felt a rare love for books at the time and spent much of their time in the illumination and decor of manuscripts. This work of writing and illuminating manuscripts began in the mid-seventh century and lasted shortly after the year 800. The oldest manuscript is the “Book of Durrow” (now in the Trinity College of Dublin), which was made in the monastery of the same name founded by the monks of St. Columban. In the interlaced that decorates its marginal fringes, sometimes arranged in strips surrounding large rosettes, are also stylized animals with elements typical of Nordic art. The lion of John (folio 191v) of the Book of Durrow, between 650-700 (library at Trinity College, Dublin). Carpet page with interlaced animals, folio 125v of the Book of Durrow. The beginning of the Gospel of Mark from the Book of Durrow, with a lavishly designed capital N, folio 86. 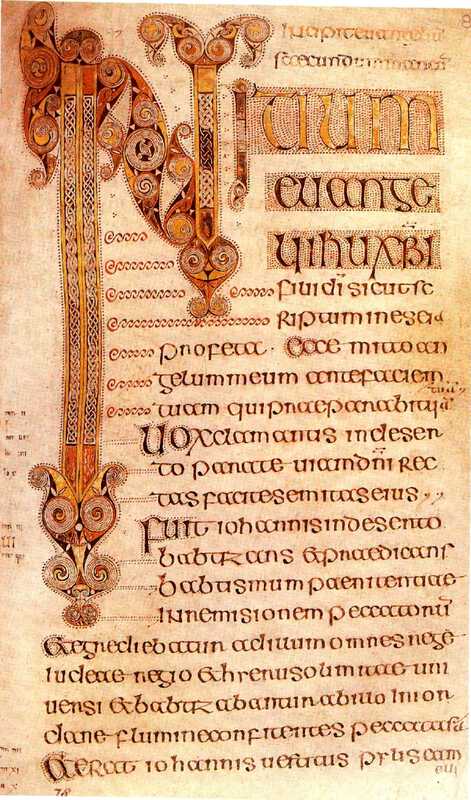 The text of each of the Gospels contained in the “Book of Durrow” begins with a page containing the symbol of the Evangelist in the center of a framework of interlaced decoration; then follows a page completely decorated with abstract motifs (known as a “carpet” page*) and next follows the first page with text, which begins with a monumental capital letter. Only three colors have been used throughout the entire manuscript: an orange-yellow, an intense green and a beautiful golden yellow. The three colors are spread in equal proportions over the ivory surfaces of parchment. Detail of a carpet page of the Lindisfarne Gospels produced around the year 700 (British Library, London). Matthew the Evangelist, illustration from the Lindisfarne Gospels. Page with the “Chi-Rho” monogram at the start of the Gospel of Matthew, Lindisfarne Gospels. Ornamentation is richer and ostentatious in the “Book of Lindisfarne” (British Museum) which was illuminated in the scriptorium of the monastery of the same name in Northumbria. It is from the early eighth century and besides the beautiful capital letters and pages entirely decorated with interlaced designs, it also contains four pages with the figures of the Evangelists in a sleek design, certainly inspired in Italian Benedictine codices, and foreshadows qualities that will be characteristic of the best English miniatures found in later manuscripts. The pages of the “Lindisfarne Gospel” are filled with abstract ornamentation of incredible complexity. The colors are the same as in the “Book of Durrow” plus blue, purple, pink, and mauve. In the winding bestiary of Lindisfarne, half animals and half birds play hide and seek in an endless maze of optical illusions that lead to a frenzy of abstract forms. This ornamental and calligraphic style was at its highest ornamental and “baroque” paroxysm in the “Book of Kells” of around 800 (also at Trinity College in Dublin), made by fugitive monks from Iona. This codex also contains some figurative compositions in traditional Irish style with a strong oriental influence and distant resemblances of Coptic art, characteristics that can also be seen in the pages of another famous manuscript, the Gospels of Saint-Gall, from mid- VIII century. Book of Kells , ca. 800 AD. The folio 34r contains the Chi Rho monogram. Chi and Rho are the first two letters of the word Christ in Greek (Trinity College Library, Dublin). Book of Kells: detail of the folio 5r, a page with the Eusebian Canons. Book of Kells, folio 292r with the beginning of the Gospel of John. Gospels of Saint Gall, image of an Evangelist (Abbey of St. Gall cathedral library, Switzerland). It seems clear that the Irish decorative style, similar in proportion to the Oriental artistic influences, taught Romanesque artists of the eleventh and twelfth centuries to take the human figure and fold it, stretch it and twist it capriciously to comply with the ornamentation laws to fully cover the surface to be decorated (either a manuscript, a column’s capital, etc.). The style of Irish goldsmiths and miniaturists was based, like all abstract art, in the complete independence of shapes and forms from the real world. The spiral, braids and circles create a world of strange mirages in which heads of monsters and human beings, beasts legs and birds’ tails appear and disappear. The flowing lines and the wisely spread rhythm of colors suggest a strange repertory of forms, a world parallel to our own with its own laws; a world of unique beings that transform into one another and end up mysteriously vanishing in a game of purely mathematical lines. 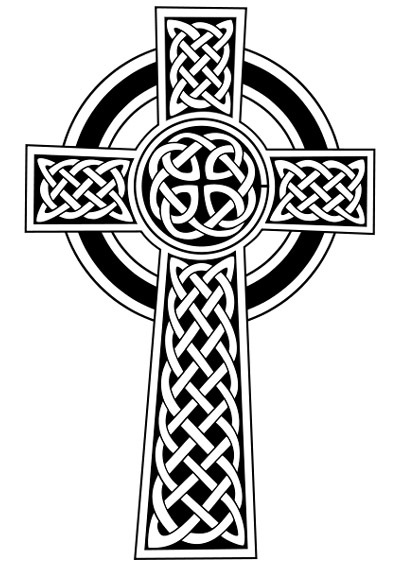 *Celtic High Cross: A free-standing high Christian cross or standing cross made of stone and often richly decorated, typical of Irish-Celtic tradition. They are symbols that combine a cross with a ring surrounding its intersection representing a nimbus or halo. The cross’ stem is longer than the other three “arms”. *Runes: The letters forming the runic alphabets, which were used to write various Germanic languages before the adoption of the Latin alphabet and for specialized purposes thereafter. The earliest runic inscriptions date from around 150 AD. The characters were generally replaced by the Latin alphabet as the cultures that had used runes underwent Christianization, by approximately 700 AD in central Europe and 1100 AD in northern Europe. However, the use of runes persisted for specialized purposes in northern Europe. *Brooch: A decorative jewelry item designed to be attached to garments, often to hold them closed. It is usually made of metal, often silver or gold but sometimes bronze or some other material. Brooches are frequently decorated with enamel or with gemstones and may be solely for ornament or sometimes serve a practical function as a fastening, perhaps for a cloak. The earliest known brooches are from the Bronze Age.